This past summer, archaeologists from the Çatalhöyük Research Project unearthed two marble figurines, considered one of the most significant finds in the project’s 23-year history. The project involved several universities and professionals around the world, with more than 100 people working on-site every summer. The discovery of the figurines immediately attracted the attention of the project’s different teams and specialists. Çatalhöyük is a large Neolithic settlement in present-day Turkey. It was occupied from approximately 7500 to 5700 B.C. These figurines were found by a Polish team in one of the upper layers of Çatalhöyük, representing a time period close to the end of occupation (around 6300 to 6000 B.C.). The well-preserved craftsmanship and subject of these figurines distinguish them from most of the other figurines found in Çatalhöyük, which are often clay depictions of animals. The newly-found figurines are made of marble, a much rarer material. 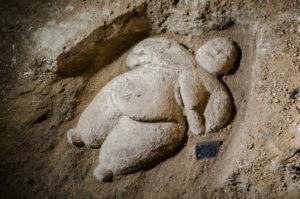 These types of figurines, in the past, were thought to depict “mother goddesses.” However, the figurines of women found in Çatalhöyük were very rarely associated with children. One of the most interesting characteristics about these figurines is their context. While figurines are usually found in rubble piles — many are accidentally conserved from the clay being burned in a fire — these figurines seem to have been intentionally placed face-up under a platform. In early Çatalhöyük, it was customary for people to bury their dead underneath the floor. By the time period in which these figurines were made, the trend of burial in Çatalhöyük had started to evolve towards more proper cemeteries. Therefore, the dead were buried in external houses as opposed to within the house. These figures, however, were found under a platform that archaeologists would have expected to find burials. They were also found with two objects: a piece of volcanic glass commonly used for making tool and a piece of galena, a lead ore. Contact Aulden Foltz at afoltz ‘at’ stanford.edu.